Joe Fyfe (b. 1952 in New York, New York) is based in New York City. He repurposes found materials like kites, signs, and banners to reveal the poetic beauty within overlooked everyday objects. 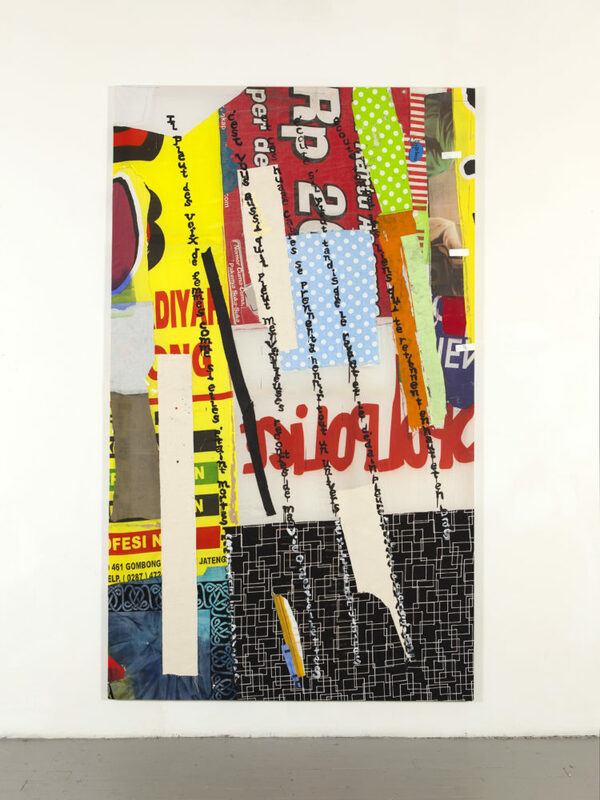 Culled from daily refuse—particularly that of impoverished areas in Southeast Asia—Fyfe’s work documents regional transitions and globalization. They are deliberately nonrepresentational, allowing materials to dictate form and come together on their own, rather than adhere to a preconceived artist’s vision. Fyfe received his BFA in 1976 from the University of the Arts in Philadelphia, Pennsylvania. He has been publishing art criticism and essays extensively for the past twenty years and is the recipient of numerous residencies and awards, including a Fulbright Scholarship (2006-07), a Guggenheim Fellowship (2008), and a Pollock Krasner Foundation Grant (2004, 2015). Joe is a 2015 New York City Artadia Awardee. Joe joins Artadia for a brief discussion about his work. 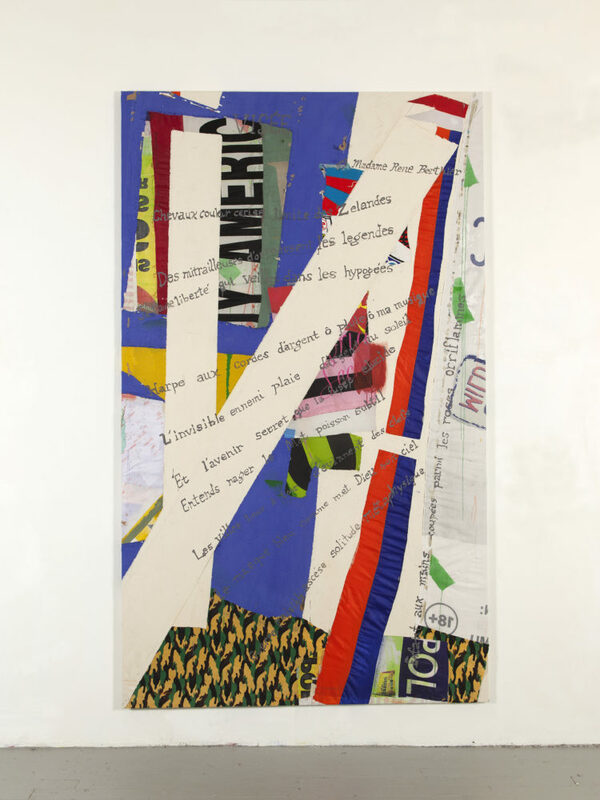 His new solo exhibition, “But A Flag Has Flown Away,” is on view at Nathalie Karg Gallery in New York through February 10. It is an Artforum “Must See” show. A: You received the Artadia Award in 2015. Could you speak a little bit about what you were working on at that time? JF: I had had a solo exhibition in NYC that opened in December 2014 & ran through January of 2015. The show was very diverse, which characterized what I was doing then & had been doing for a while: sculptures that were assembled from found objects, car bumpers & signage, bound assemblages of cut wood, re-configured banners, framed collections of photographs of things seen in passing combined with diverse materials, masonite, paint… stretched paintings made from outdoor signage, my usual thing. Later that year, when the Artadia selection committee came to the studio, I made a point of buying a bathtub so I could fill it up with found materials as a centerpiece for the paintings and other things that I had installed in the studio. Using a bathtub as a framing element was a new method of making something that was both a sculpture and a picture, my primary concern then & now. 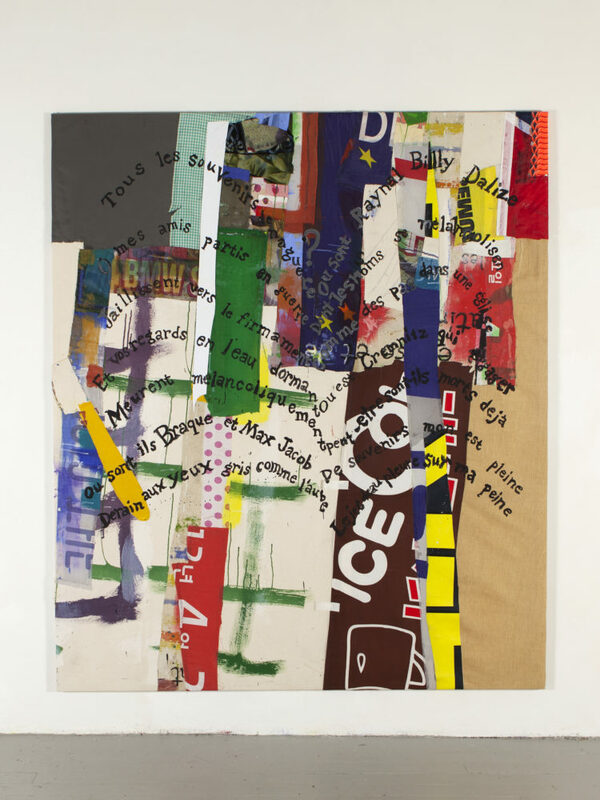 A: In your newest body of work at Nathalie Karg Gallery, your artist statement mentions that each piece corresponds to a poem written by Guillaume Apollinaire when he was serving in World War I. Could you talk about how this relationship between poetry and painting came about? JF: Desperation. I was dissatisfied with a painting I had, um, assembled. I decided to impose the Apollinaire poem, ‘Il Pleut” which is a kind of pictograph made up of a series of diagonal lines of text streaming down the page like rain. Beautiful thing. And it made the painting work. I decided to do a series of them because there are a number of Calligrammes by this extraordinary poet and art critic. It just so happened to be the 100th anniversary of the Armistice, but I was unaware of that when I was making them. Correspondences often seem to crop up in artmaking. Personally, I see these paintings as being about my relationship to French culture, which is that of a face pressed up against a window, tantalized by what’s on the other side. And being that my French is almost nonexistent, it was the equivalent of introducing new, strangely attractive gestures onto the surfaces. A: You frequently use found materials in your work. What is the process of gathering this refuse like? What do you look for when you’re collecting these items – how do you decide what is useful? JF: Well, as I understand it, modern art begins with the artist walking down the street & looking around & putting the street in their work somehow: I remain Baudelaire’s perfect flaneur. But in this age of cheap air travel I can walk down the street lots of places. That is how my work reflects the contemporary. In some other parts of the world where I have been, printed banners for advertising and announcements of all kinds are in wide use. Many (convenient for my purposes) are made from cotton, canvas & nylon. They can also be found, after the event has passed they were manufactured for or they have become weathered, bound in small lots and sold in markets, to be repurposed as sun protection, made into umbrellas or just used for rags. Being that I am interested in activating the substrate of the painting with new materials, I am happy to use these. I like them for their color, drawn shapes, images, lettering and tactility. A: Globalism is a frequently mentioned theme of your work. Has the rise of globalization, especially with the internet, changed the direction of your work over time? JF: I don’t think anything will ever replace moving the body through the world. That is how I have improved my picture of the world. I find it painful to reflect that Americans, who live in a country that has such an outsized influence on the planet and on their fellow residents are so incurious about what’s beyond our borders. I don’t think the internet has changed that. If my paintings are nothing more than the equivalent of a bunch of travel stickers on a suitcase, I do think they are prescriptive for that reason. I don’t think Americans are aware of how much other countries are in conversation with one another, and how isolated we are. Regretfully, the world has become more and more of a suburban mall & one can go almost anywhere & avoid any meaningful contact. But it’s important to travel & search out the intercises. When I think about globalization I think of my first visit to Asia in 1989. I stopped in Singapore, the paradigm for authoritarian consumerist societies. I thought, what have we here? Then of course the Singapore model swept the world. If you are impoverished, you will readily sacrifice personal freedoms for a better standard of living. I traveled for other reasons, but I was clearly witnessing this model manifesting itself wherever I went. It came particularly swiftly to Vietnam, where I lived for a while on a Fulbright and I still return to every few years. I got to know a lot of artists there, and the government doesn’t make things easy for them. And the Arab Spring made that government very nervous and more repressive. Despite its problems, Vietnam is a very, very interesting, special place. A: In addition to your own artwork, you have written extensively about art and other artists. Does your past art criticism influence your current work? JF: I have always respected the craft of writing, and with the help of some good editors, Raphael Rubinstein in particular, I was able to improve mine. Learning to write for publication enabled me to educate myself further as I could visit artists everywhere. I spent a lot of time in Paris, where I discovered a substantial discourse involving painting. Writing about painting in France from WWII up to the present has perhaps been the biggest influence on my work. But then, through my writing I also discovered and met, Han Josephsohn and Tran Trung Tin, great artists that I would also consider influences. A: You are a frequent international traveler, but were born in New York City and continue to live here. What keeps you returning to New York? JF: I was away long enough at one point that after contemplating living permanently elsewhere I began to understand that I needed the familiar more than I suspected. And I love the space in Brooklyn where I have lived and worked for 33 years. If I continue to have the same wonderful, benign landlord there is no reason to not keep returning. To see more of Joe’s work, visit his website and his artist registry page. Joe’s bio and all images courtesy of Joe Fyfe and Nathalie Karg Gallery.